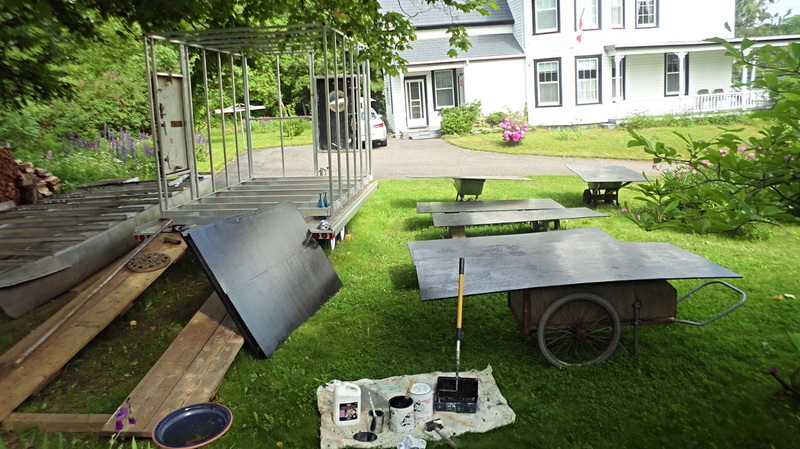 May 2014, after a long cold winter, finally able to work outside without freezing. 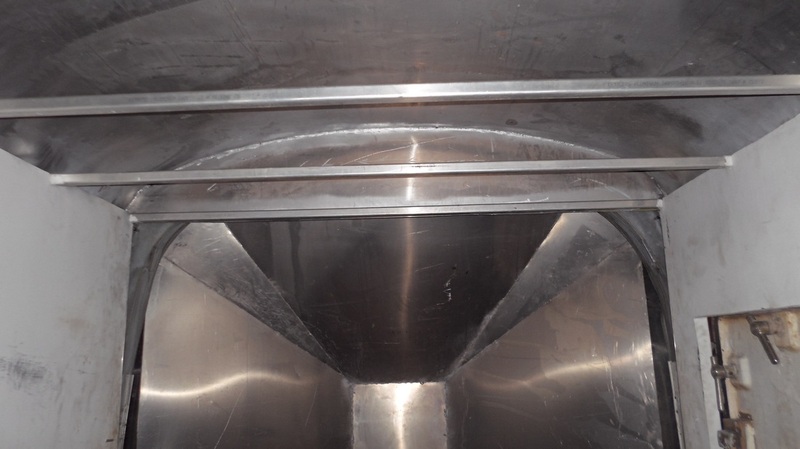 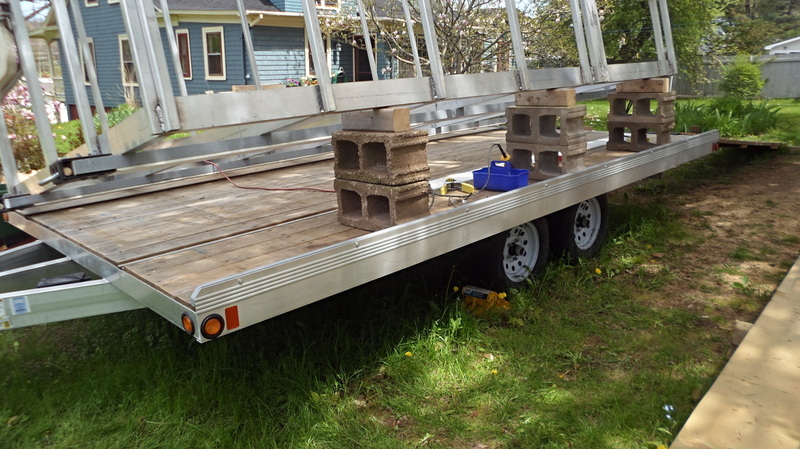 The first job was to mount the skids on the bottom. 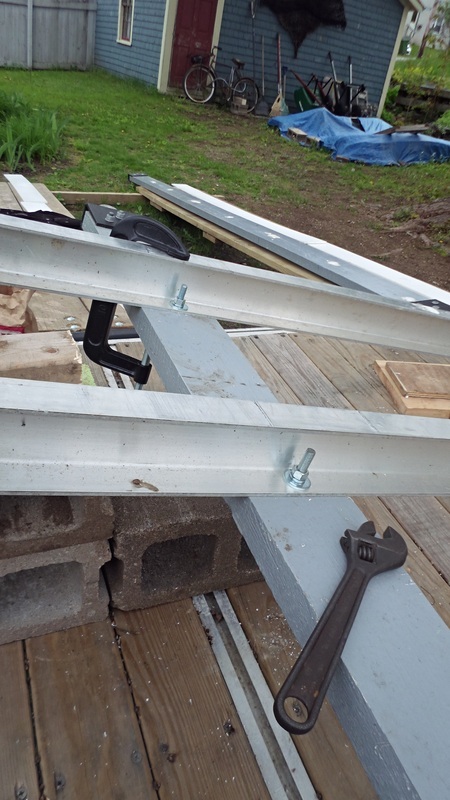 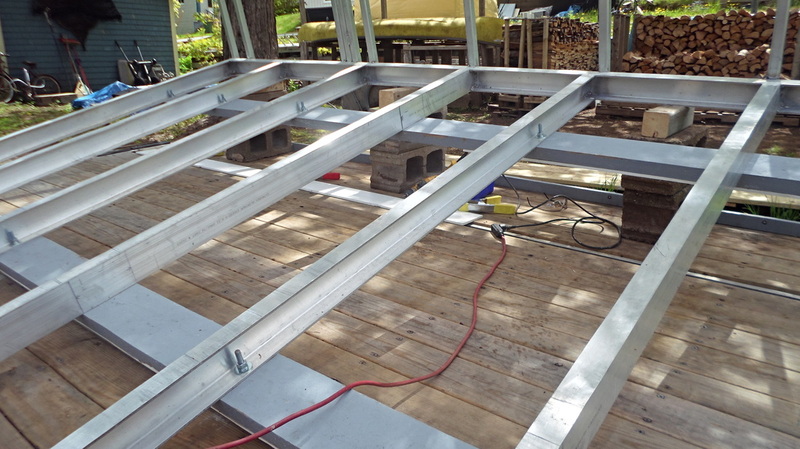 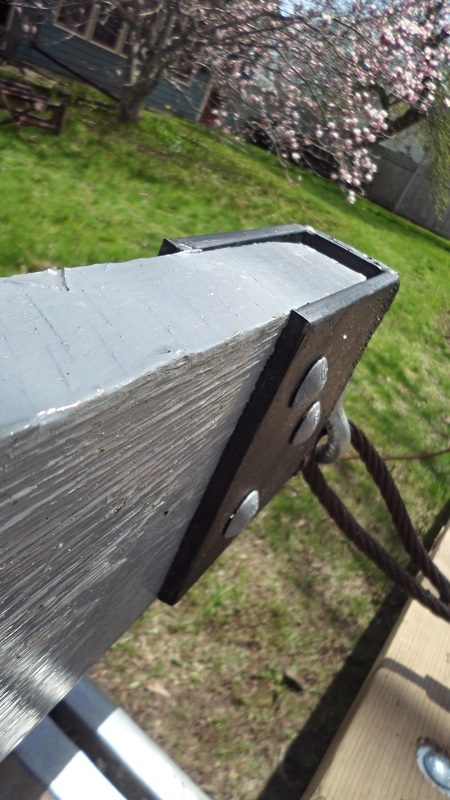 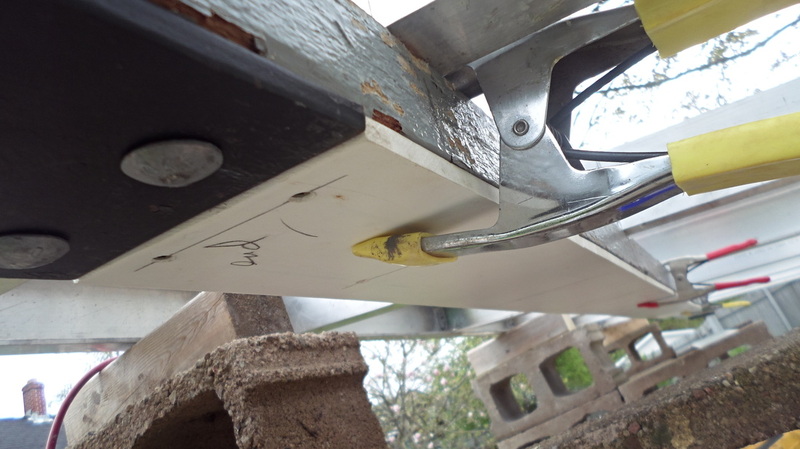 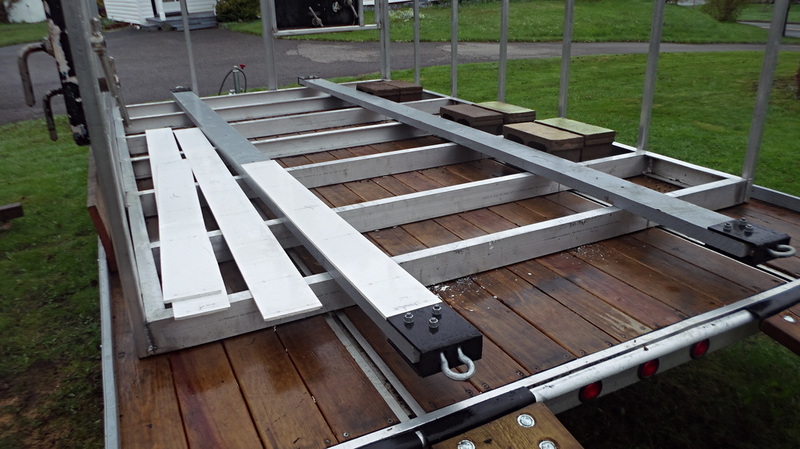 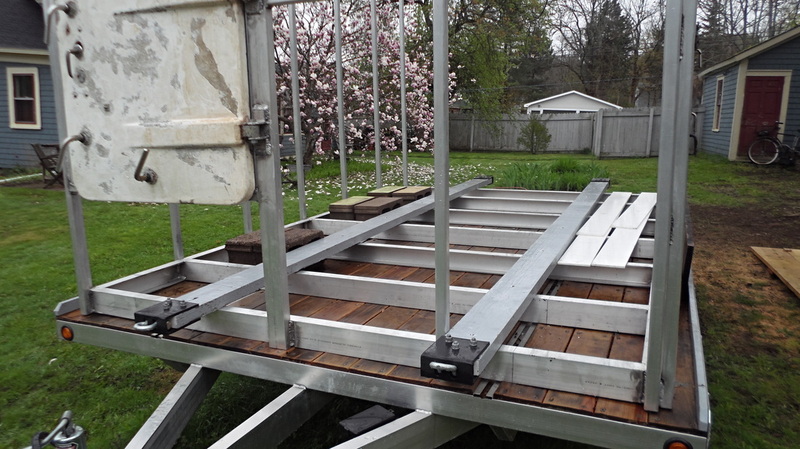 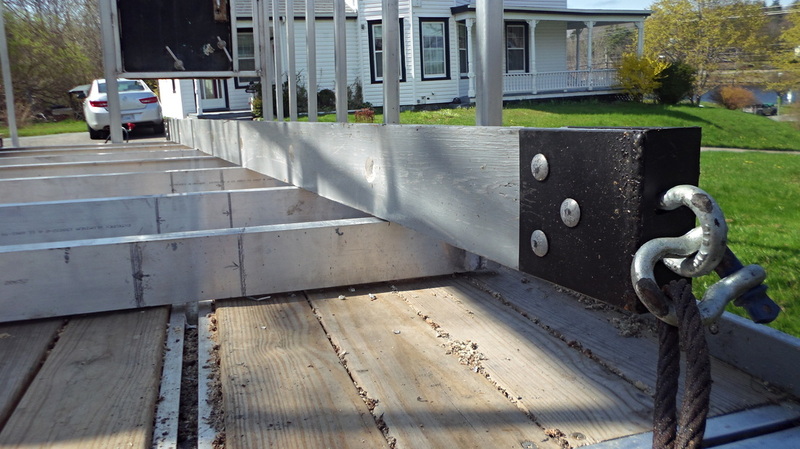 Two 2"x6"x14' hardwood skids with metal end clamp attachments on each end are bolted to the floor joist, with a quarter inch plastic skid plate screwed to the bottom. 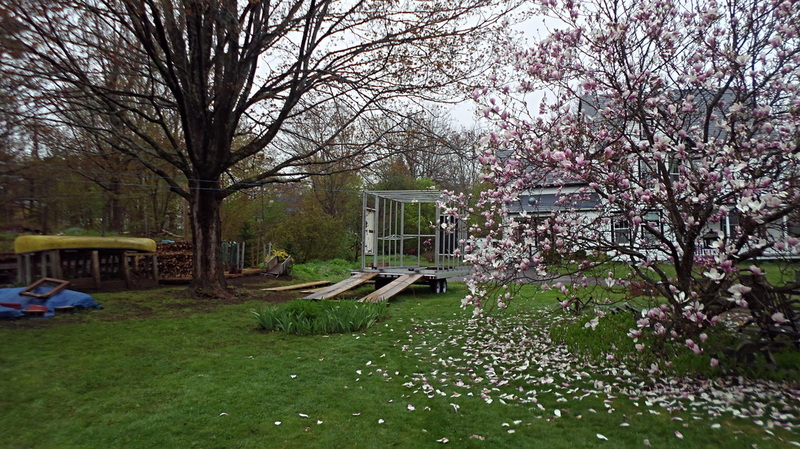 Next step is to box in the frame by installing plywood floor and plywood inner walls. 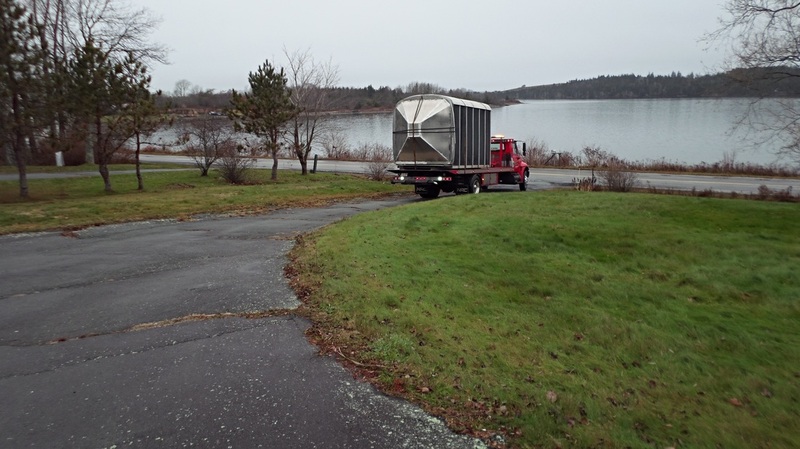 Gone the way of the dory fisherman. 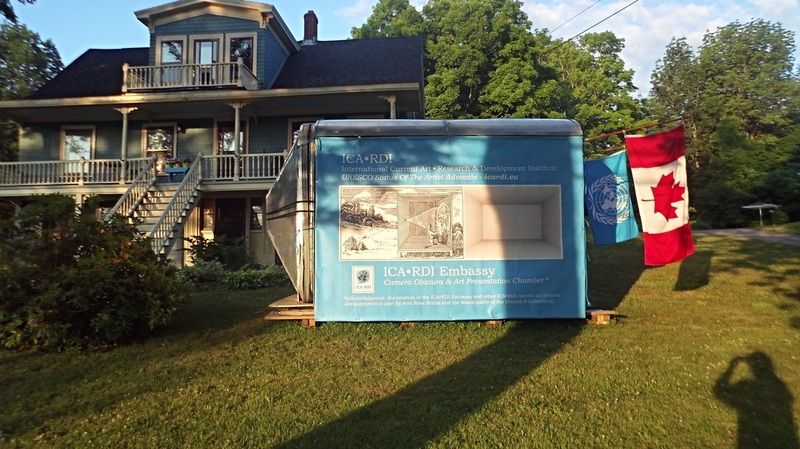 ICA•RDI Embassy ~ installing the interior walls, mid July 2014. 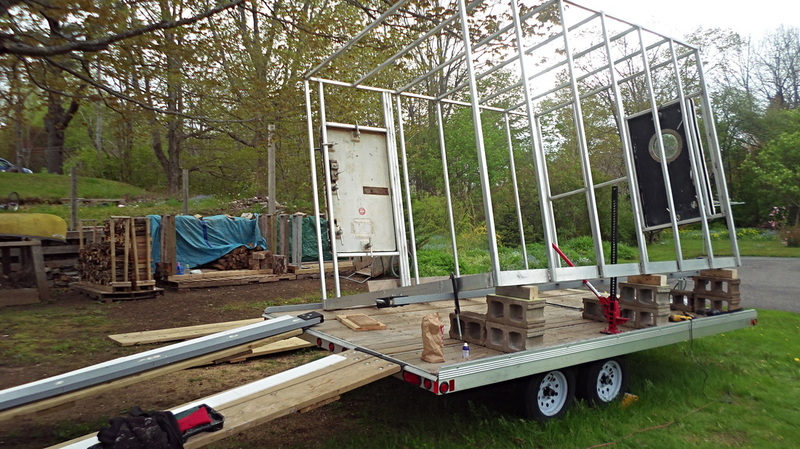 Interior walls are half inch plywood, fir, finished one side. 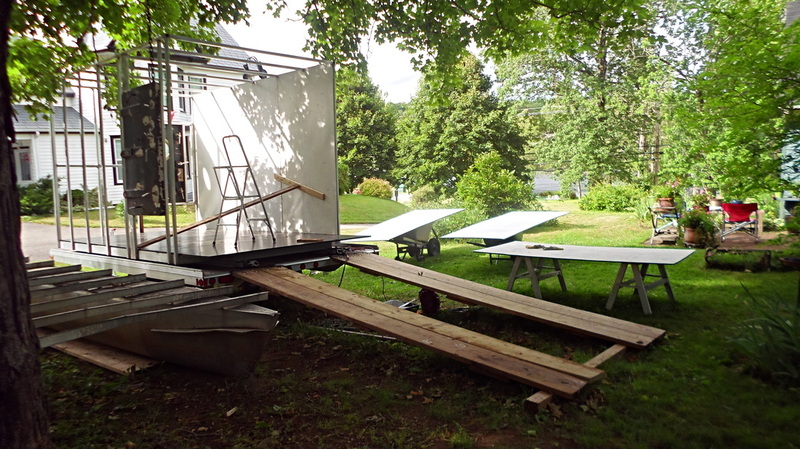 The floor is three quarter inch plywood. 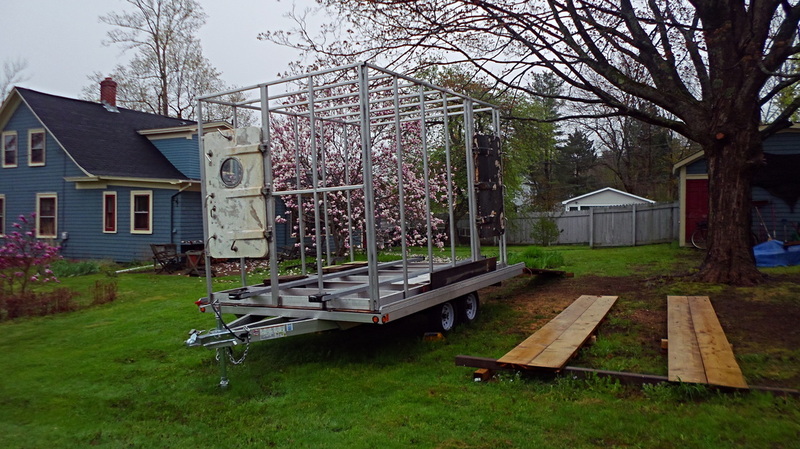 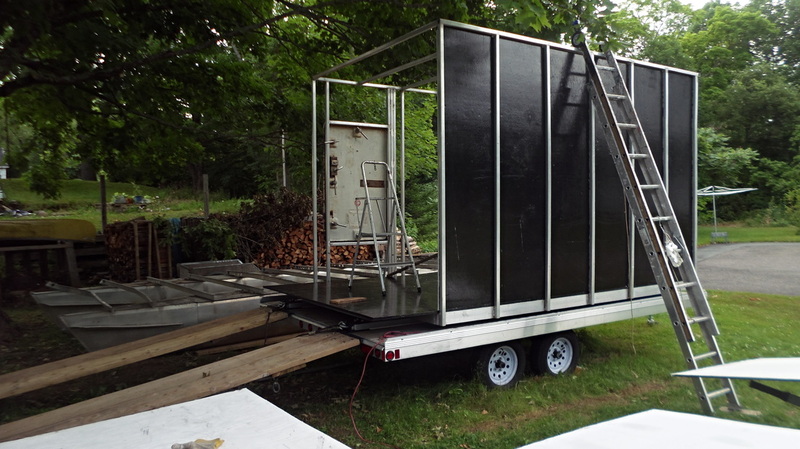 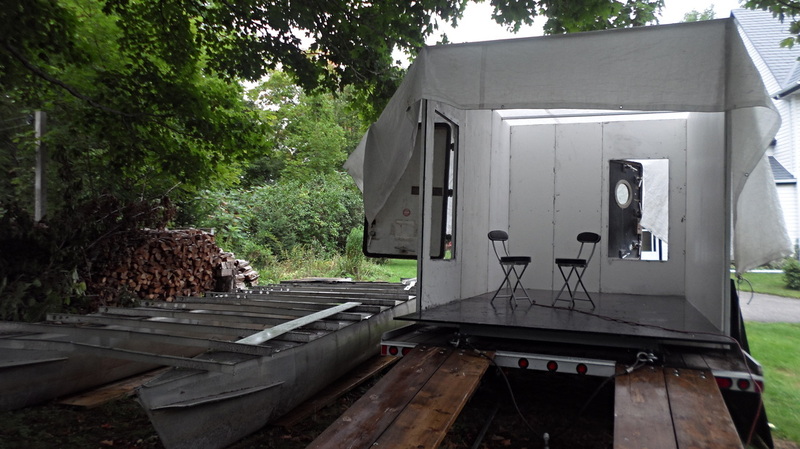 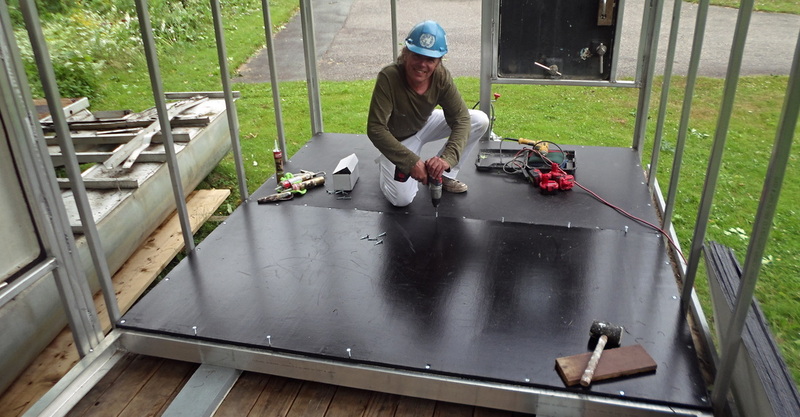 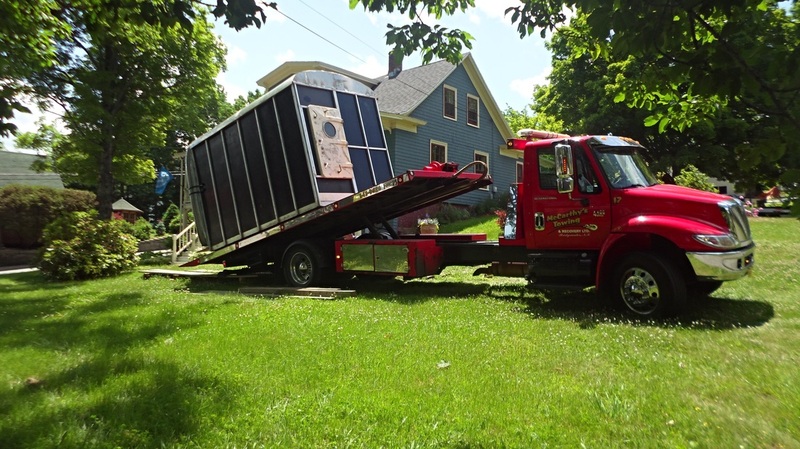 Waiting for Conferrals - ICA•RDI Embassy (Mobile Amphibious Art Presentation Chamber & Camera Obscura) with all the inner 1/2” fir plywood walls up, August 2014. 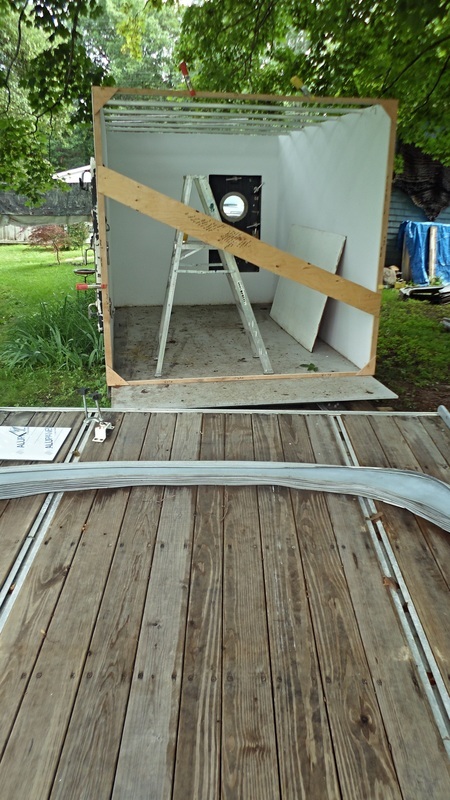 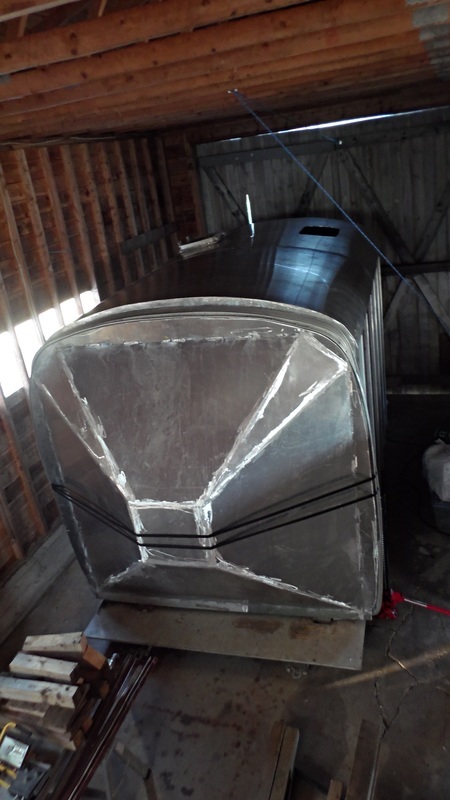 The next stage is to mount the bus bellows on the back, as the top curvature of the bellows will determine the roof trusses. 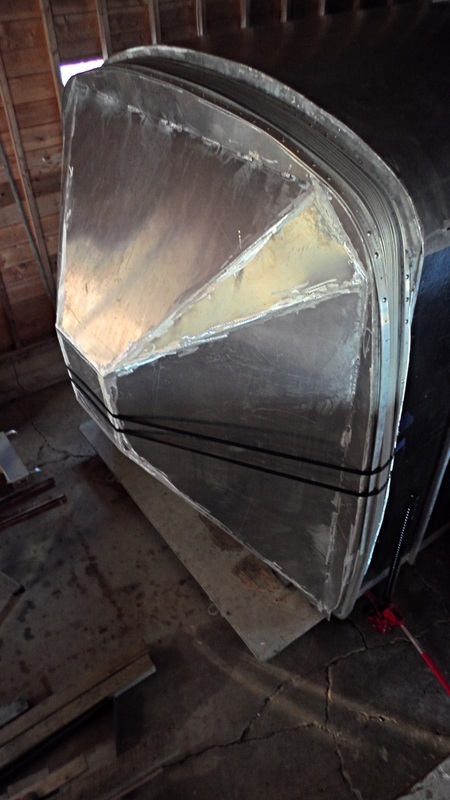 Cleaning the bellows to be mounted on the backend of the ICA•RDI Embassy, July 2015 - Waiting for the welder. 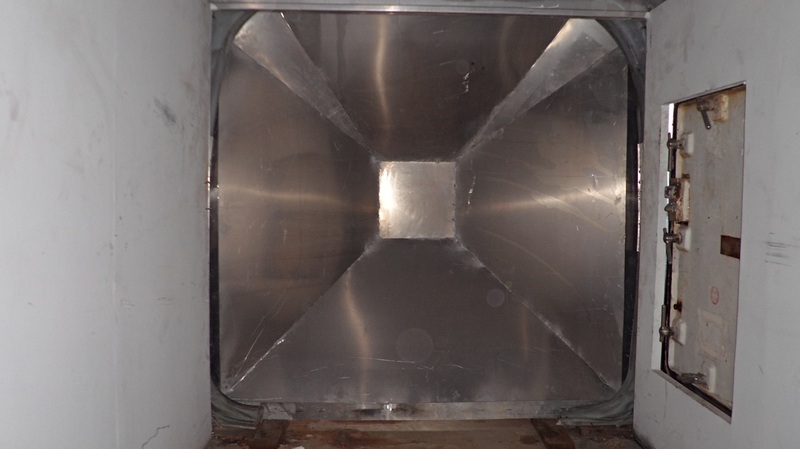 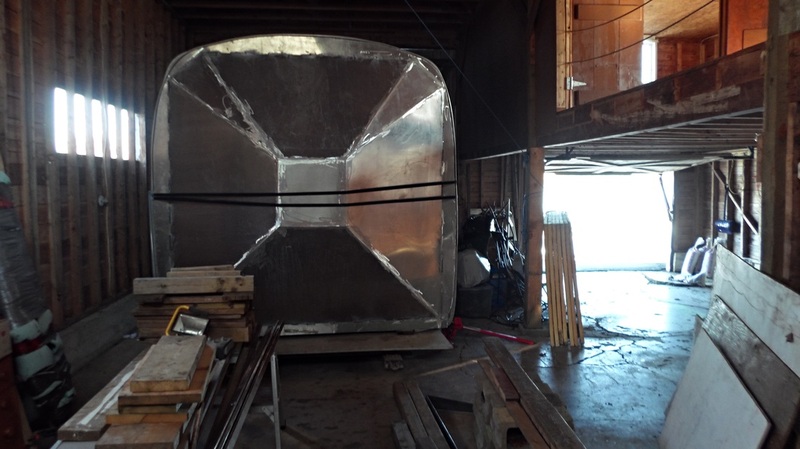 On Dec. 2, 2015, after over four month, I finally retrieved the ICA•RDI Embassy from the welder who was charged with constructing a roof with two Farley Mowat ship’s windows as skylights, and mounting the bus bellows and fabricating a cone “lens” shape for the end of the bellows. 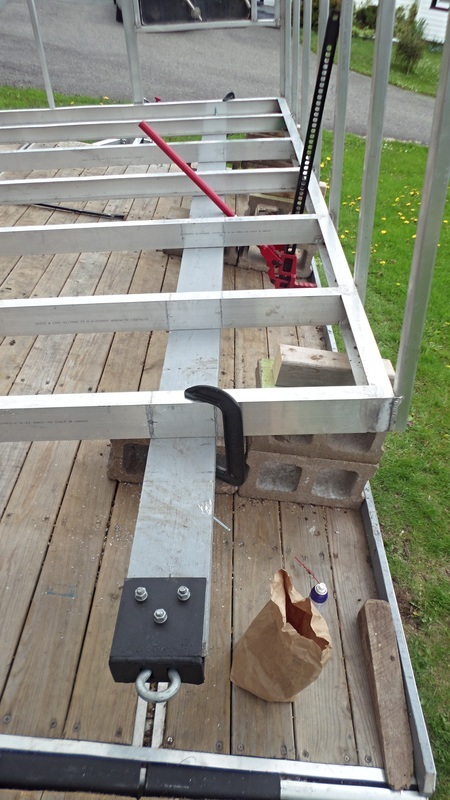 The welder had a variety of reasons why this work took so long to complete; I was locked in having given him an advance for the materials. 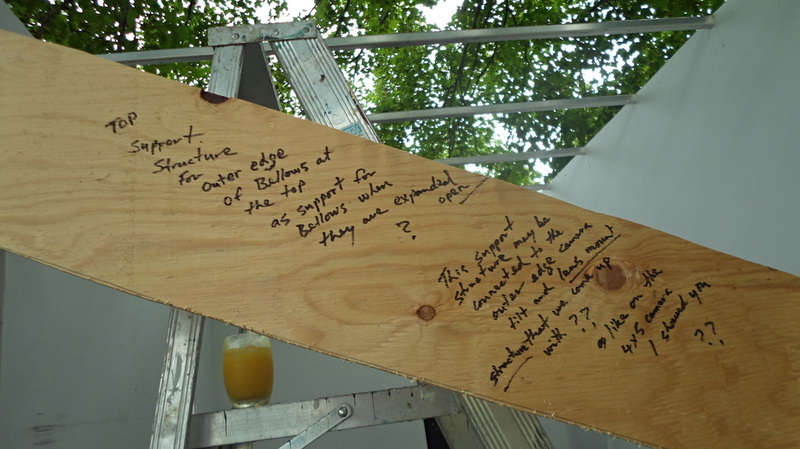 That’s behind us; I now look forward to working on the many details that need to be completed on the ICA•RDi Embassy (e.g. 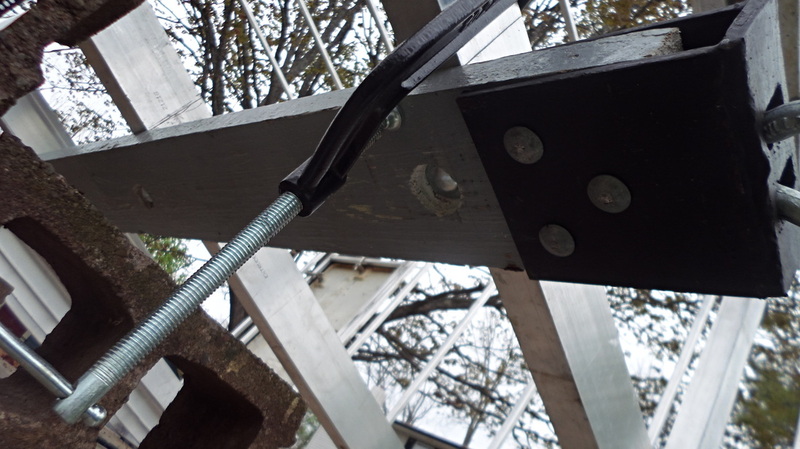 both inside electrical and outside surface skin) without being dependent on someone else. 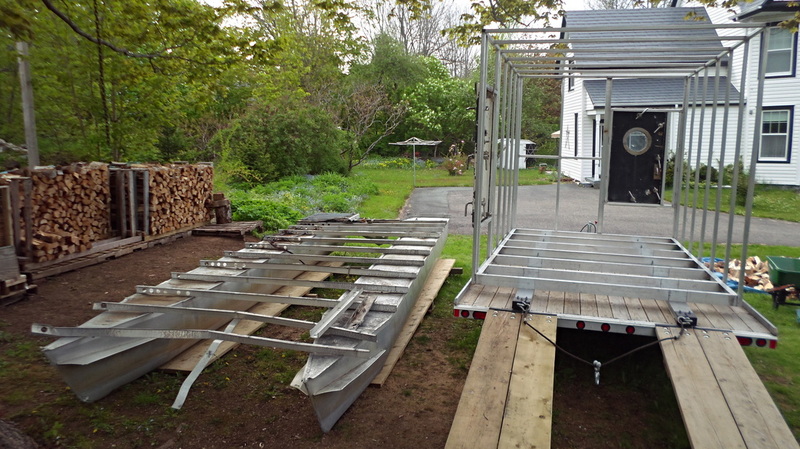 This work will be done this winter in a friend’s boat building shed in Bayport, Nova Scotia, just a few kilometers south of Lunenburg. 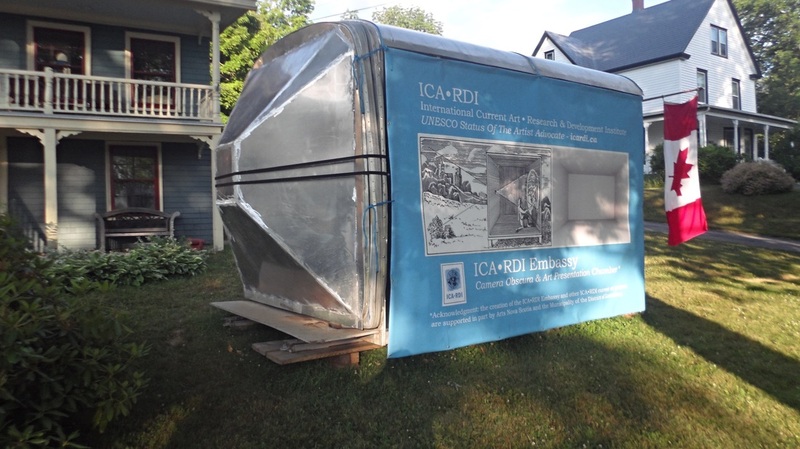 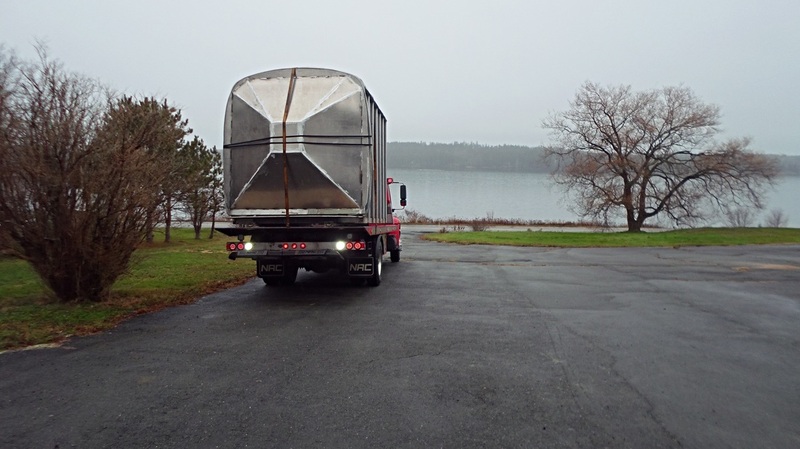 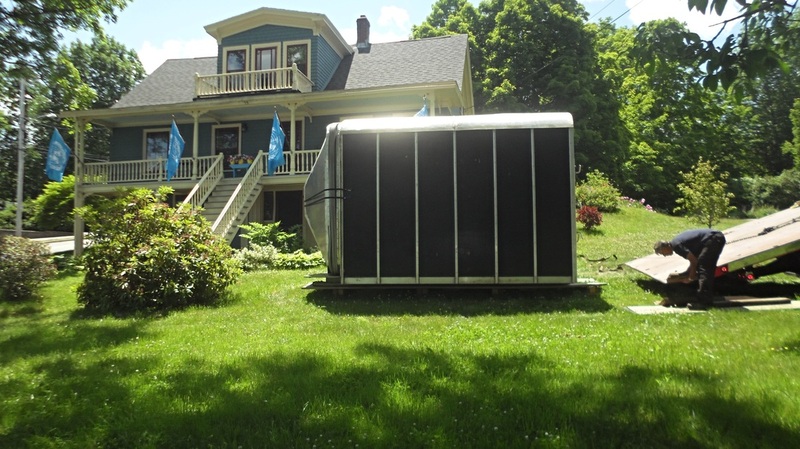 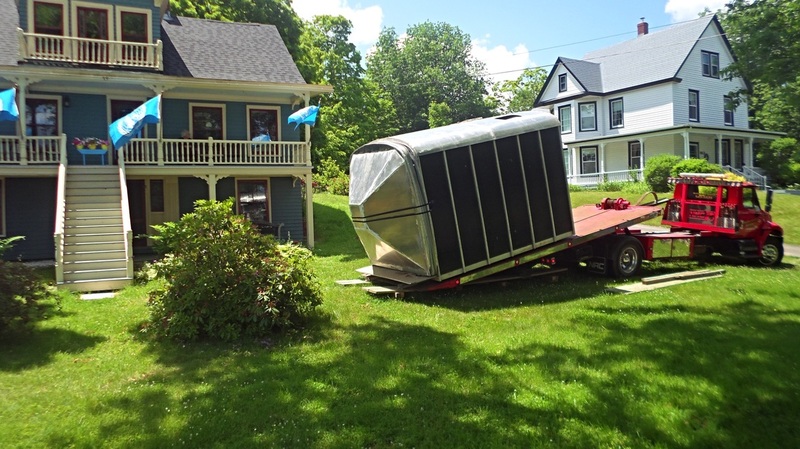 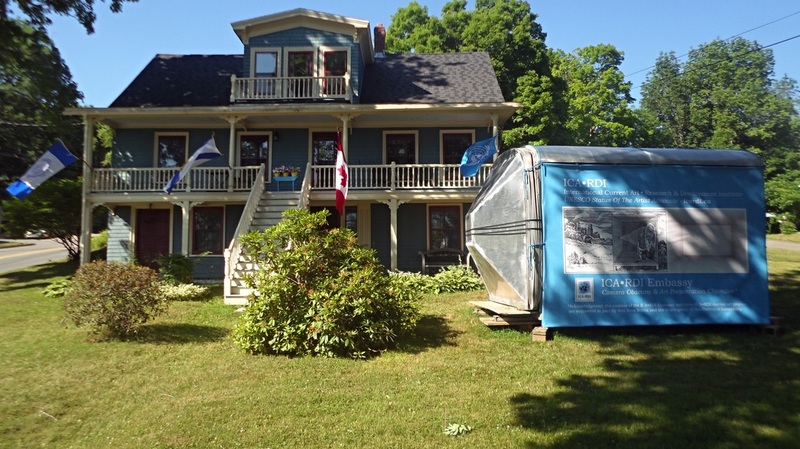 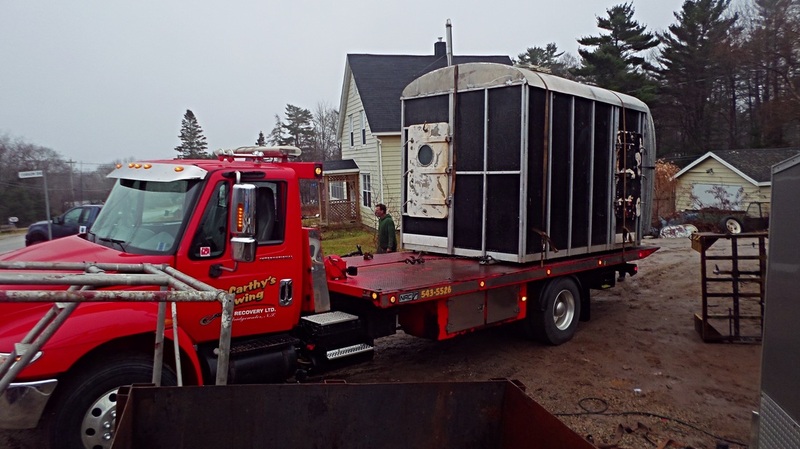 ICA•RDI would like to thank ‘Arts Nova Scotia’ for their support regarding the on-going research & development of the ICA•RDI Embassy - Mobile Amphibious Art Presentation Chamber/Camera Obscura. 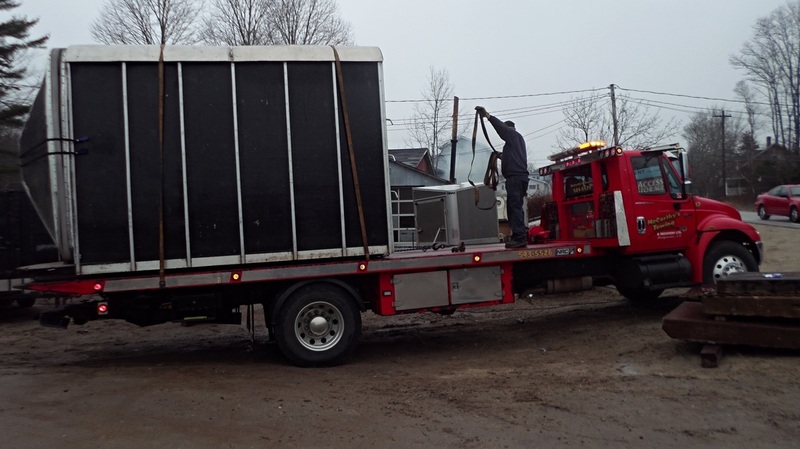 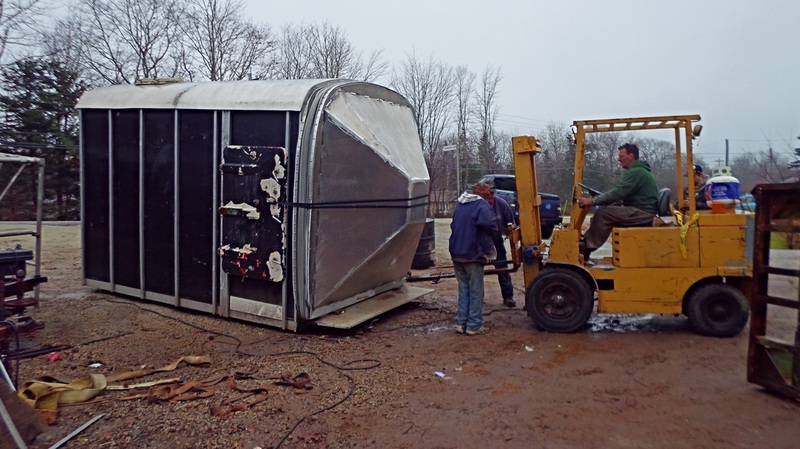 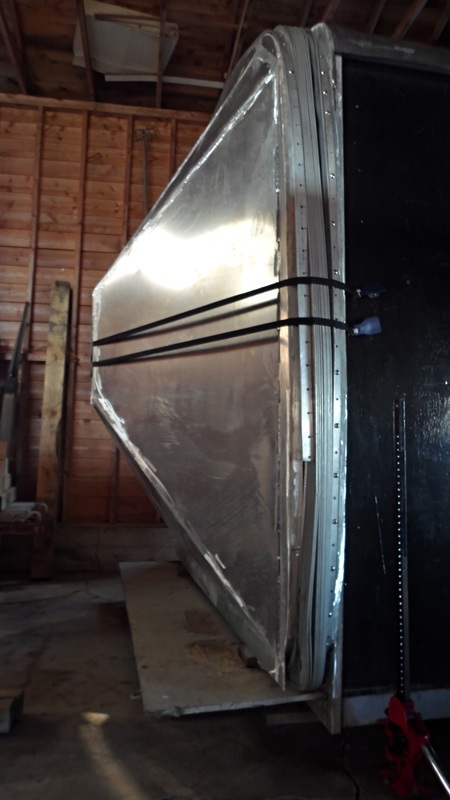 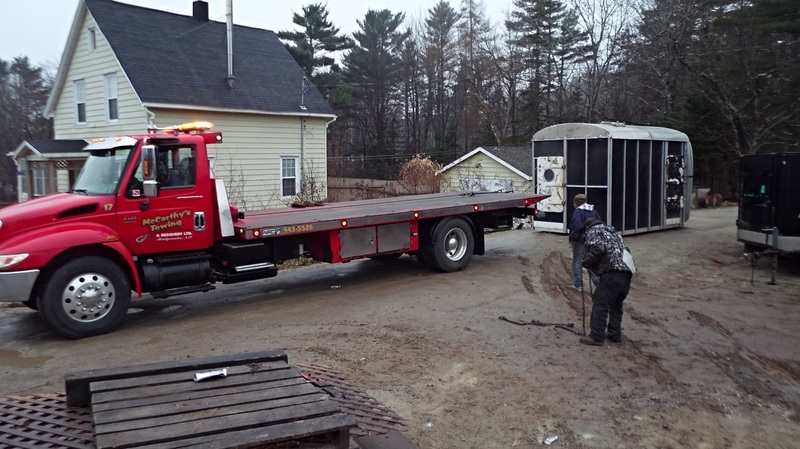 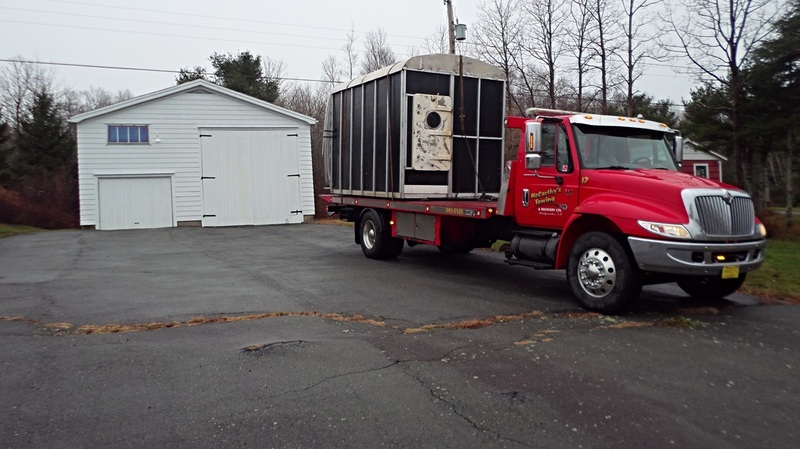 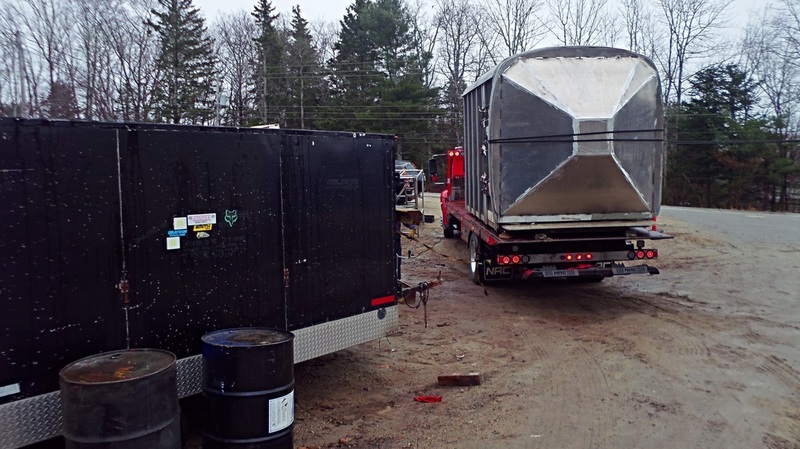 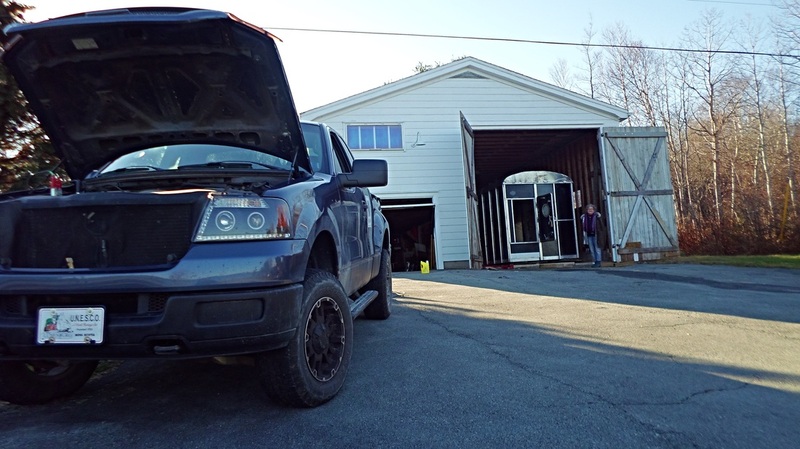 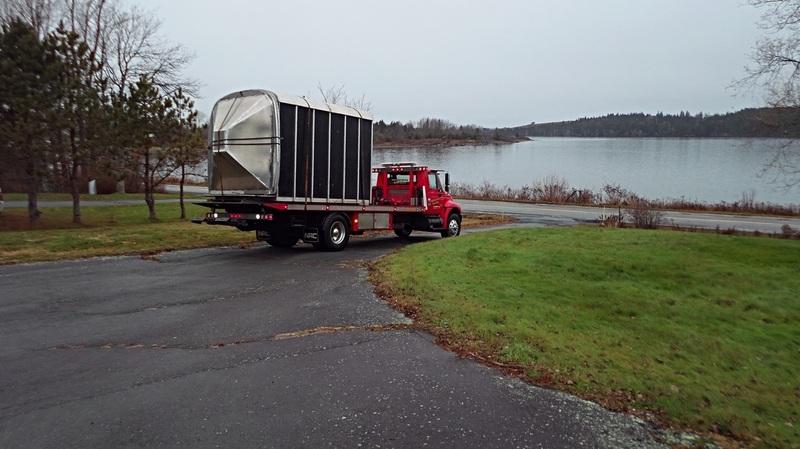 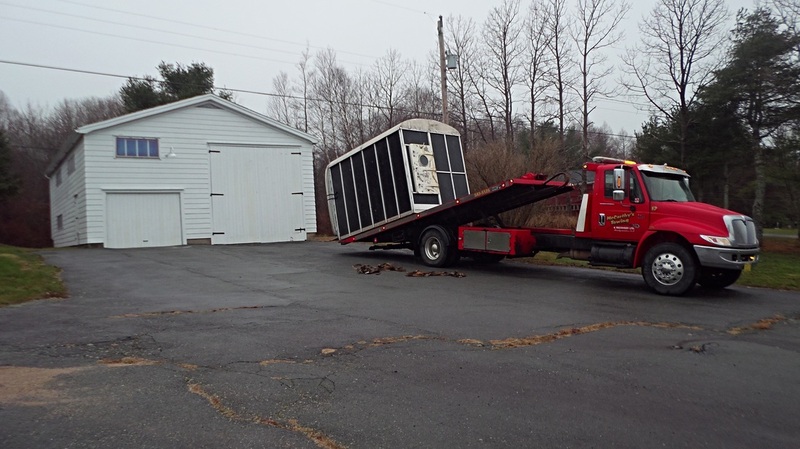 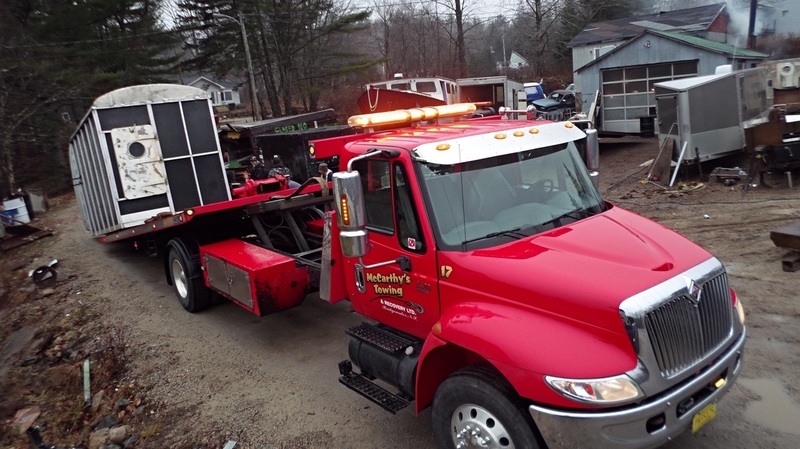 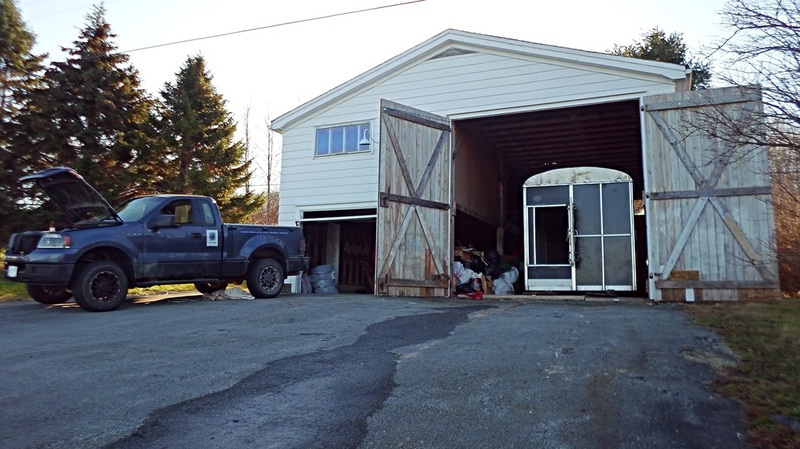 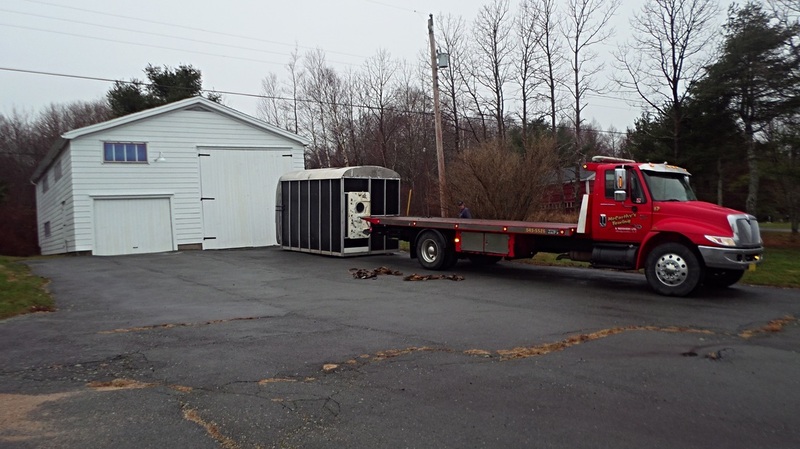 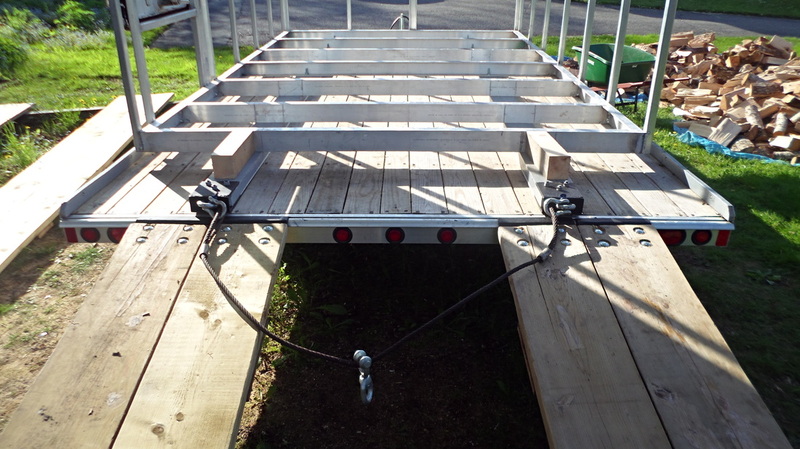 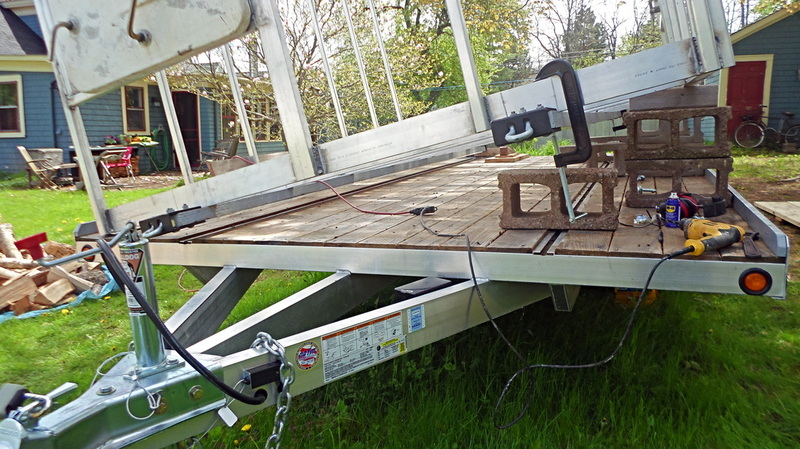 December 6, 2015 - beautiful day on the south shore, 12º C. - winched the ICA•RDI Embassy into the boat shed today (kind of a 45º pull - winch on the back of the truck to a pulley at the back end of the shed to pull the Embassy straight in). 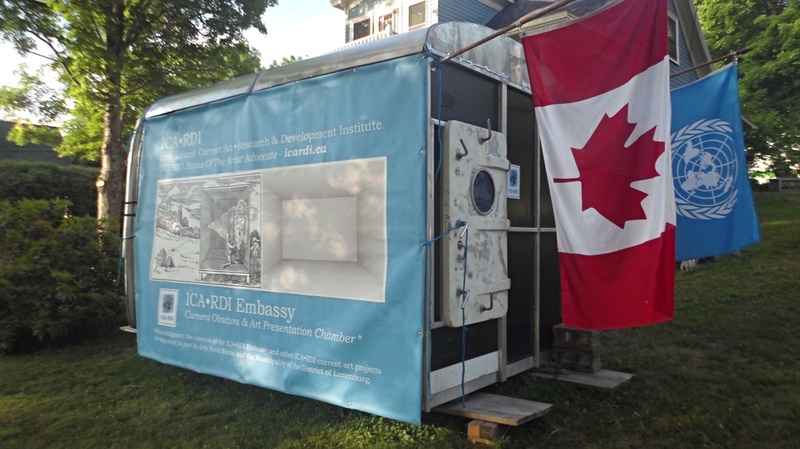 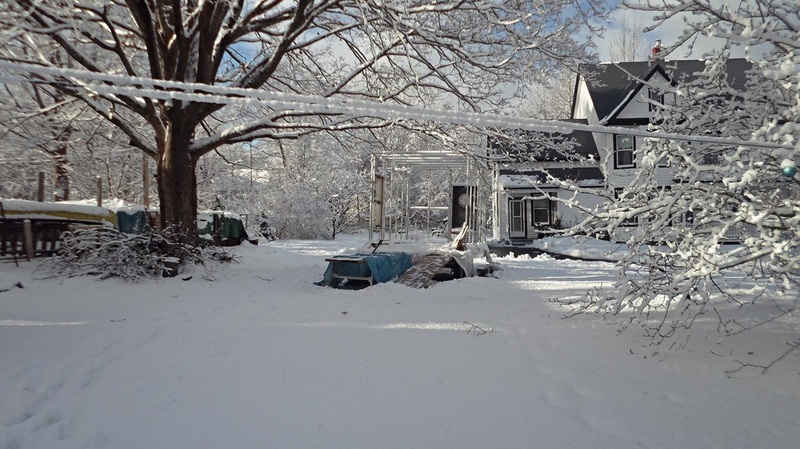 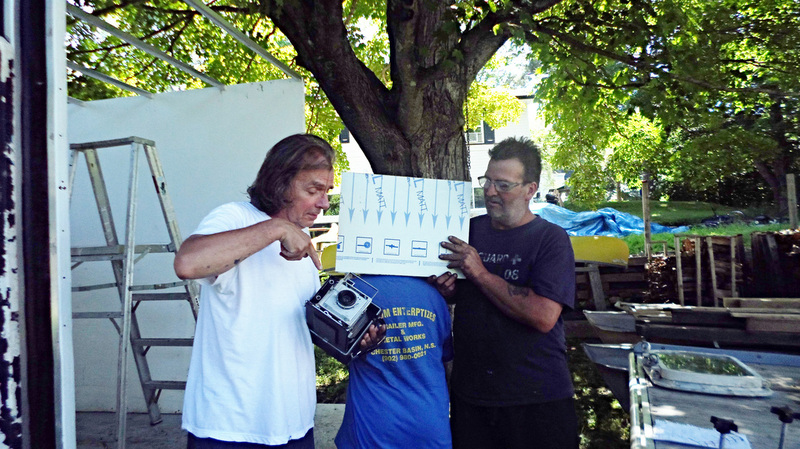 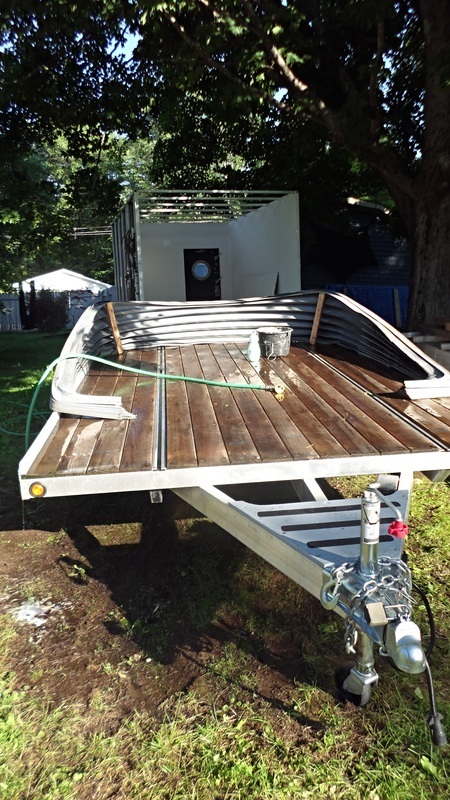 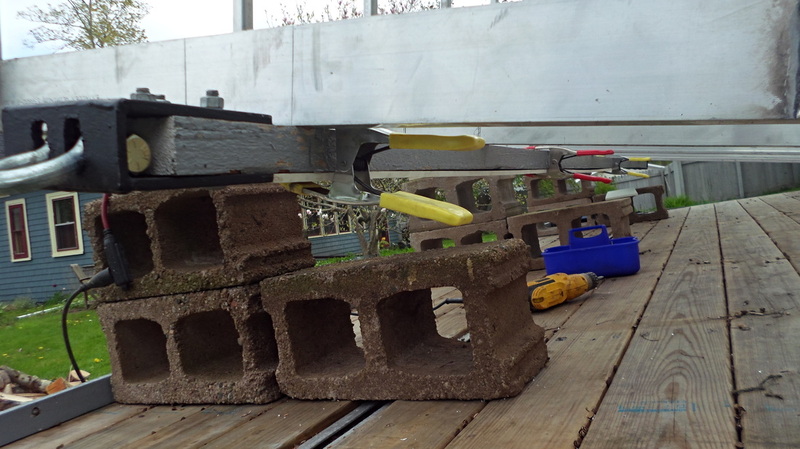 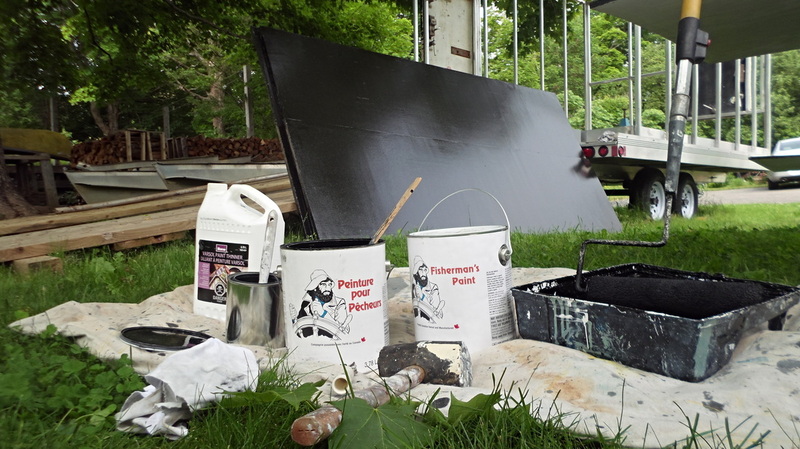 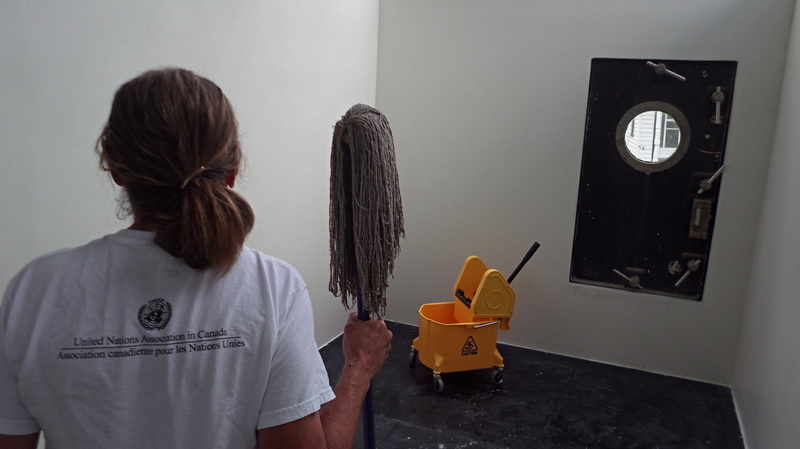 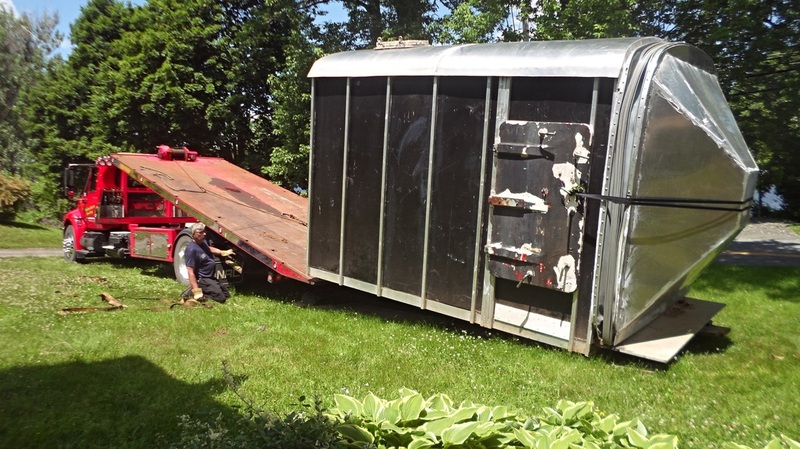 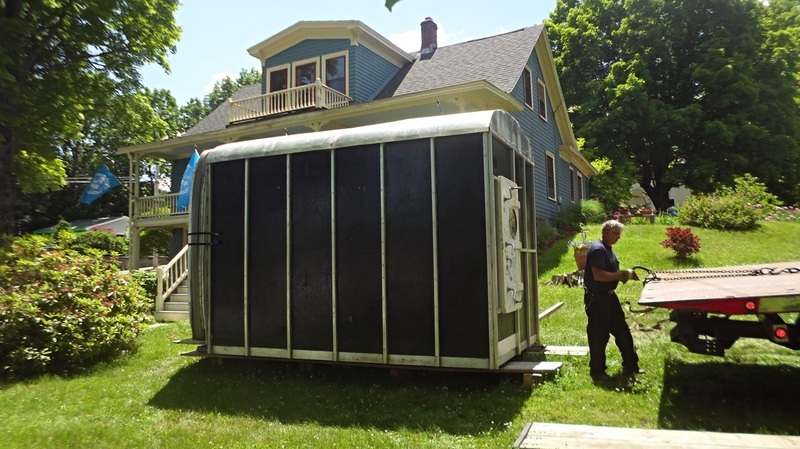 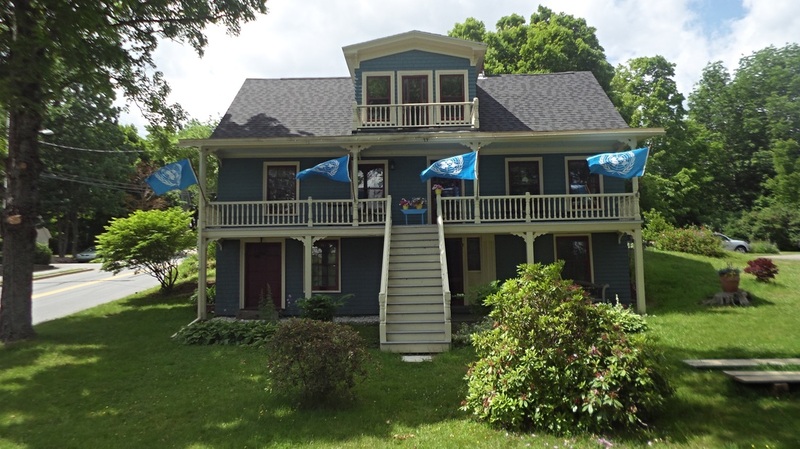 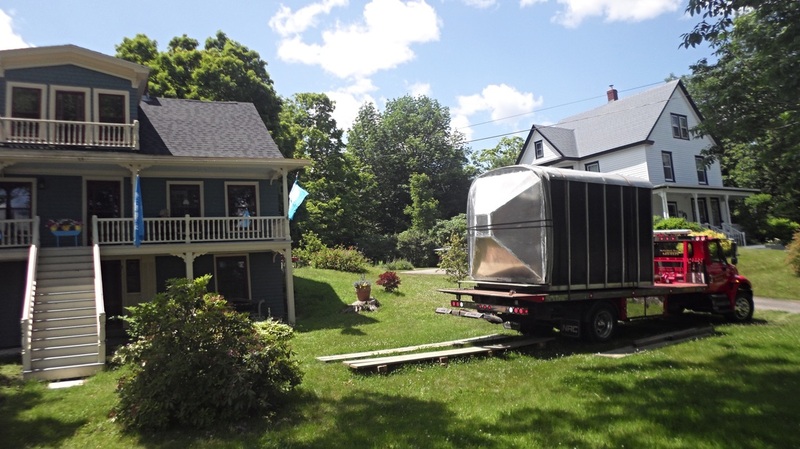 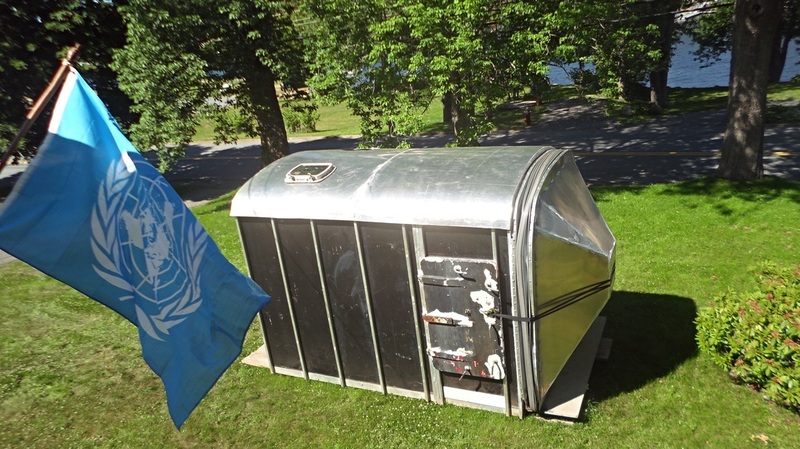 ​ICA•RDI Embassy spent the winter in a friend's boat shed, in June 2016 it was moved to the front lawn of the ICA•RDI Residence for the final phase of construction. 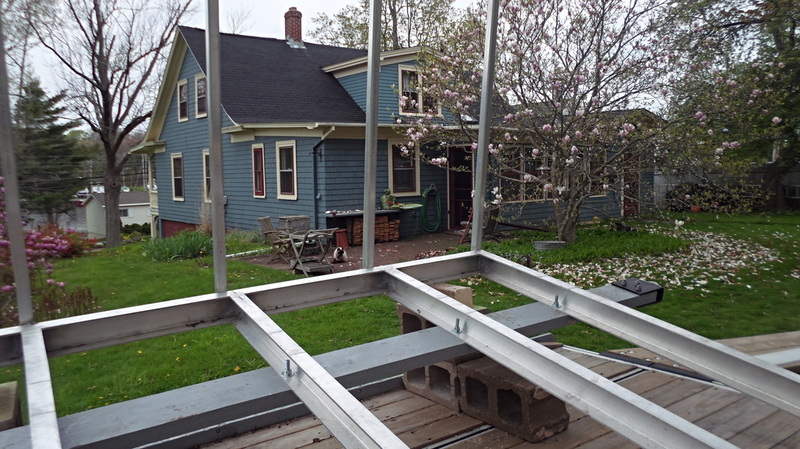 Basically the main structural form is completed, this summer will focus on the many remaining details, like an outside skin, electrical (track lighting,etc), support structure for the bellows movement, signage, etc. 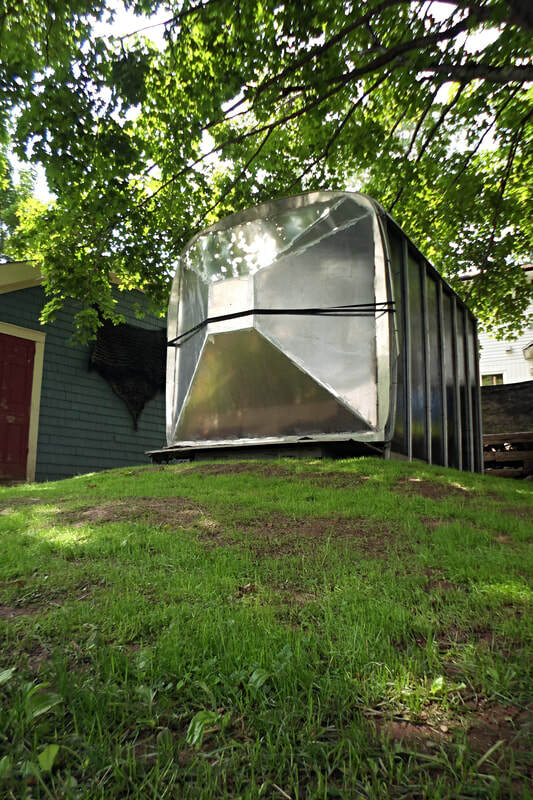 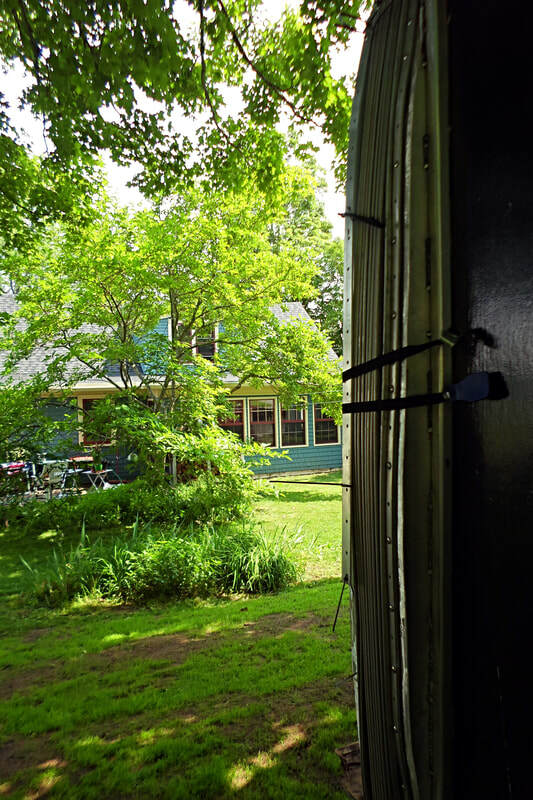 Grassy Knoll - In the Spring 2018 the ICA•RDI Embassy - Art Presentation Chamber & Camera Obscura was moved to the backyard of the ICA•RDI Residence where test photographs will be created shooting from the grassy knoll at the magnolia tree.